Finland and Belgium face off to deploy the world’s first GPS pay-as-you-go road toll system. 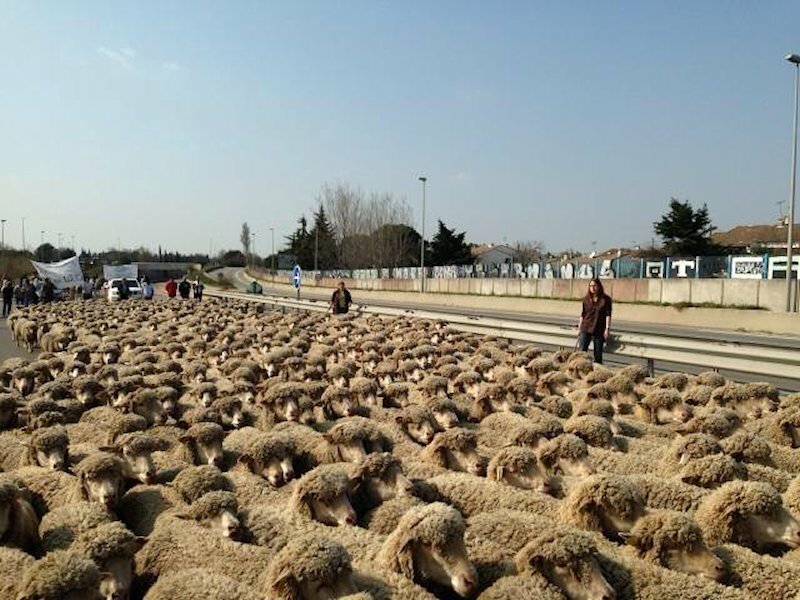 French farmers fill the A54 with sheep in a bid to prevent reform while Bosnian farmers continue their border blockade. New ferries from Portsmouth-Santander (Brittany Ferries’ ‘economie’) and transCaspian Baku-Astrakhan. The EU puts its priority transport corridors in order and a Swedish trucker employs a lame excuse. Will bundle with other services to help sell the idea to drivers. There’s an unofficial race underway in Europe to debut the world’s first GPS-based road tolling system. Within weeks of a trial starting in Belgium, Finland has now announced a similar experiment. But whereas the Belgian system simply uses an onboard tracker unit (OBU) to track driver movements, and bill for them later, the Finnish idea is to build a ‘multi-service platform’ of driver services of which road tolling will be just one. Other services will include traffic, weather and parking plus other smartphone-style apps. The video above uses Apple’s new CarPlay in-car communications as an example. It’s clear too that the Finnish government thinks this new ‘transport ecosystem’ will help sell the idea to voters. ‘We strongly believe that this OBU will not cost so much to the drivers when it has other services than just road pricing data,’ says Risto Murto, a director of the Ministry of Transport. It should certainly be cost effective as the govt expects developers to shoulder much of the cost. GPS systems also do away with expensive roadside infrastructure. The trial starts in June. A govt sponsored report published in December recommended replacing all vehicle taxes (except fuel) with a pay-as-you-go road tolling system. It would be tax neutral for motorists doing the average 17,000km per year. An opinion poll taken shortly after showed 55% were against though the principle objection was not privacy, as expected, but unfairness to rural motorists. If all goes to plan the system could be up and running by 2020. The next step for Belgian road tolls depends on the results of this year’s General Election. French farmers demonstrating against reform of the Common Agricultural Policy blocked the A9 and A54 motorways between Nimes and Arles in the South of France today. The protest started off relatively low key in the mid-afternoon – and appeared to disperse – only to come back much stronger in the early evening when both roads were effectively shut, and/or severely restricted until 21:00. It’s not clear yet whether more actions are planned. Photo via Twitter, photographer unknown. roundup: SWEDEN. A club foot caused a truck driver to speed he claimed though the court disagreed and fined him 3600SEK (£340) for the 125kmh-in-a-90kmh zone offence. CASPIAN SEA. A new ro-ro ferry route between Baku and Astrakhan starts in April, using the ship ‘Bestekar Gara Garayev’. Useful as its cuts out the exciting but risky North Caucasus regions Chechnya and Dagestan. FERRIES. Brittany Ferries new ‘no frills’ UK-France-Spain ‘economie’ ferry is now available to book. Departing Sunday 6 April we were quoted £119 one-way Portsmouth-Santander, plus £115 for a cabin. Reclining seats are available at £10 each. BOSNIA. Farmers are on day three of their blockade of Orasje border crossing. After 08:00 it was barred to all vehicles except for emergencies. See a map of alternatives. TRANSPORT. The EU now has a full complement of co-ordinators for its nine ‘core network corridors’. More on this soon, or see here for more.